Religion, conflict – and what about truth? There is an increasing awareness of a link between religion and conflict. No one would argue that this has not been a negative combination in the past. The outstanding issue is whether this needs to be so in the future. In the present civil-political worldview, two contrasting positions are being held: On the one hand, in the pursuit of peace, we need more religion, while. on the other hand, to overcome conflict and hatred, we need less religion. Over the last decade there has been a proliferation of studies, books, conferences and statements, relevant to this issue. Religion, ethics and values are thus intertwined themes in an abundance of publications and reports. The prevalent approach is historic and pragmatic rather than one dealing with the claim-on-truth underpinning the self-understanding of every religion. In fact, where the claim-on-truth is pushed to the forefront, the argument tends to be more fundamentalist in nature, barring any constructive contribution from religion in terms of reconciliation and peace. That the issue of truth is not irrelevant – or is inherently destructive to religion as a source of peace, is a lesson that has been learned from the last fifty or so years, albeit a careful reading of this history gives a hint of a direction rather than an unambiguous argument for a positive role of religion. The claim-on-truth characterizes the monotheistic religions, Judaism, Christianity and Islam, which also are known as the religions of the Book, whose followers are joined together as the children of Abraham. It is also in these three religions that the role of fundamentalism as an expression of defence of the absolute truth is seen most clearly. This does not overlook fundamentalist expressions that also exist in Buddhism and Hinduism. I suggest that in the context of conflict and peace, and in particular in the pursuit of reconciliation, the issue of truth has to be dealt with on several levels. The claim-on-truth relates to knowledge about the essence of God – the being of God. Truth understood as facts is of paramount importance for genuine reconciliation to take place. When Jesus referred to himself as “the way, the truth and the life,” his interpretation of religious truth shifted the focus from interpreting the essence and character of God to how truth shapes our lives religiously and socially. The quest for truth in the context of reconciliation is genuinely religious and practical. In my view, the post- apartheid process on truth and reconciliation, led by Archbishop Desmond Tutu, presupposes the relevance of truth in a religious and ethical sense to post-war trauma for individuals as well as for society as a whole. However, other post-conflict experiences have indicated that there is a need to address the wounds of war in a more juridical and formal way as well. Genocide, ethnic cleansing and crimes against humanity need to be dealt with in a way that responds to the victims’ suffering and to civil society’s sense of justice before reconciliation may have a chance. This dimension of truth is to a large extent consonant with the concept of justice found in the Torah, the New Testament and the Koran. If there is a shift to be noted over the last decade or so, in the relation between religion, truth and reconciliation, it is that religion has emerged from relative obscurity in “world affairs” to a position of political relevance in policy making. The death of ideologies created a vacuum which is being filled with the search for values (ethics), and a new quest for a spirituality which addresses the larger issues of humanity, such as war and peace, poverty, disease and terrorism. I believe that there is a lesson to be learned about truth and reconciliation in a political-religious context, from the rapprochement of the last fifty years between the Christian churches as demonstrated by the ecumenical movement. After World War II, the conflict-reconciliation paradigm was concentrated on inter-Christian rather than inter-religious relationships. This is despite the fact that the war caused great pain to peoples of all faiths, notably the Jewish population of the world. Although the beginnings of the modern ecumenical movement are to be found in the 1920s, it was the total breakdown of humanity and faith, demonstrated in World War II, that forced Christian leaders from many nations and many confessions to convene in Amsterdam in 1947 to bring about the creation of the World Council of Churches (WCC). Some of those behind this great initiative had already contributed in their national context to the emergence of the United Nations and the Universal Declaration of Human Rights. There was indeed a confluence of religious and humanistic commitments to create a world of peace and justice, which found expression in a global political will, to give humanity a fresh start. For the Christian churches, which had been on both sides of the conflict, the quest for truth and reconciliation was painful but inescapable. Christian leaders formed a covenant to stay together and to act together. They saw the need to address both the religious and the ethical dimensions of faith. Truth and life were seen as inseparable. During the next fifty years dialogue was understood mainly as a process of learning how to read the same authoritative sources of their shared spiritual heritage in a way which expressed the inherent unity of faith in Christ. Gradually the issue of the relationship to other faiths emerged on the ecumenical agenda, with the painful Jewish-Christian relationship as the predominant theme, followed by the need to relate in a new way to Islam as the third Abrahamic faith. The driving force in this phase of the ecumenical movement was more intellectual than moral. Hence, the nature of the dialogue was more an academic discourse on God – by whatever name – and on revealed truth, rather than on the well-being and coexistence of man in a world of peace and justice. The inter-Christian dialogue has been a success, far exceeding the expectations of the founders of the ecumenical movement. 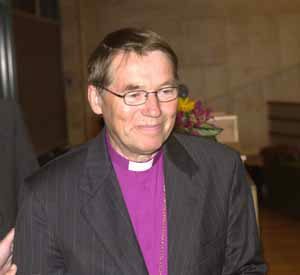 Although the concept of One Church and One World, which is inherent in the Christian message, still remains more a vision than a reality, ordinary believers have transcended boundaries of faith and discipline of church membership, to express a universalism that creates a new ecumenical reality on the ground. In fact, the recent expression of an overwhelming global unanimity among Christian churches in rejecting the reasons for the war against Iraq is a fruit of the ecumenical movement. Never before in history, have all the historic churches spoken with one voice on a single issue. This has even put the remaining dogmatic issues between the Roman Catholic, the Orthodox and the Protestant communities on the backburner. The impact of this common action, which suspended the still-existing dogmatic controversies, has yet to be explored. One lasting effect, however, could be that the dialogue between religions changes character and becomes more relevant to real-life issues. This does not imply that the vision of Christian unity can be supplanted or overtaken by a vision of unity of all religions. The basis for a greater unity between people of different faiths will instead be an increased understanding of our obligations to each other as equal members of humanity. At this point we may see a continuation of the confluence of crisis and hope that led to the foundation of the UN and the WCC. Just as World War II led to a sense of “unity in diversity” among Christian churches, “World War III” has led to the beginning of a new relationship between religions. By WWIII, I mean the ongoing wars on every continent, the continued oppression of millions of people, the brutal marginalization of a vast number of citizens of the world, the unjust distribution of wealth, the entrenched poverty and hunger of at least one fifth of the world’s population, the new forms of international terrorism combined with a breakdown of human rights and civil liberties for many in pursuit of security for the few. World War III is a different war – it knows genocide, crimes against humanity and war crimes, as well as massive violations of international law and order. The present global war is a civil war that makes all strategies of the past obsolete. The unjust war on Iraq by the American-led coalition, and the subsequent illegal occupation of this long-suffering people, epitomizes the threat to a world order based on the United Nations Charter. Likewise, the increased oppression of the Palestinian people by the present Israeli government, with the support of the United States, in violation of a series of binding UN resolutions, demonstrates disrespect for the binding norms which grew out of the disasters of the last century. There is a growing feeling that international law and governance need re-shaping, to provide room for a greater role for civil society, including religions. The overwhelming unanimity of the historic Christian churches in their condemnation of the war on Iraq has made it impossible to interpret these conflicts as a religious war along the historic Christian- Muslim divide. Nor has it been possible to see these conflicts in the new paradigm of “war of civilizations”, as argued by Samuel Huntington and others. However, it must be admitted that a new divide has opened between the historic Christian Churches and fundamentalist and charismatic groups which, regrettably, seems to form the spiritual environment of the present American president and many of his closest government aides. Some of these groups give the appearance of making common cause with groups within Islam and Judaism which thrive on an amalgamation of political and religious fundamentalism. This leaves us- in spite of the role of the historic Christian churches and moderate forces within Islam and Judaism — with an ambiguous reading of the role of religion in present-day conflicts. Fundamentalism is by definition an attitude to truth which makes absolute that which is relative. Fundamentalism is alien to democracy and modernism, and therefore threatens world peace and progress. This shift corresponds to an interpretation of “Peace, Shalom, Salaam”, which unites the spiritual and the worldly dimensions of faith. The deeper understanding of the Hebrew concept of shalom has strengthened Christian churches in their search for salvation to the suffering of people everywhere. It is the common reading of “the health of the patient”, that has forced religiously- committed people of every observance to begin to address together the healing of the world through common actions. There is a plethora of expressions to this new joint venture in social action on every continent. Numerous examples could be cited about the new role of religion in state affairs, both on the level of government and on the global level. Faith-based diplomacy is taken seriously, and is no longer “the missing dimension of statecraft.” It is increasingly becoming a truism that peace in the world is not possible without peace between religions (Küng). I will cite only one example which demonstrates the beginning of a new role for religions in overcoming conflicts and addressing peace issues in the broadest meaning of the term. The World Conference on Religions for Peace (WCRP) brings together all major faiths in a program addressing such issues as ethnic conflicts and civil wars, in a broad interpretation of what pertains to peace. Inter-religious councils have been created on every continent, and have been active in addressing local conflicts in such regions as Kosovo, Bosnia, Liberia, Sierra Leone and Sri Lanka. In June 2003 in Amman Jordan, WCRP convened religious leaders from Iraq, more than twenty Shia and Sunni Muslims, as well as Christians, for the first meeting ever between them. They themselves showed great maturity in responding to the challenges of present-day Iraq and fully acknowledged the crucial role of religion in building a future based on respect of human rights and religious freedom. They invited WCRP to accompany them in a process towards creating an inter-religious council in Iraq. Such a process will no doubt encounter a lot of obstacles, but a beginning based on a positive understanding of shared responsibility has been made. This is even more important in light of the fact that the state-imposed religious council of the Saddam-regime has been dissolved and new, separate structures have been created for each of the religious communities, Shia Muslims, Sunni-Muslims and the minority Christian communities. There is at the same time a resurgence of fundamentalist attitudes combined with ethnic identities which could spell a difficult socio-religious scene in the future. On another front, WCRP. like the UN, defines the pandemic of Aids as a threat, not only against individuals, but against societies and states, and indeed in the case of Africa as a threat against an entire continent. AIDS is the only disease that has ever been on the agenda of the Security Council and which has caused the UN to hold a Special Assembly to deal with this threat against humanity. In bringing together religious leaders on the issue of Aids, the WCRP also recognizes that religion has been a major source of stigmatization of people who suffer sexually-transmitted diseases. The positive force of most religions, upholding the dignity of every human being, is a source which should be harnessed for the common good. Even when all social structures break down, there will most likely be a religious presence in some form or other in the local community which can accompany the suffering and offer consolation and hope. In an effort to set up a program for children suffering from AIDS in Africa, WCRP has received support from such diverse sources as the Bill and Melinda Gates Foundation and the Norwegian Government. WCRP works closely with a Christian agency, Norwegian Church Aid, and thereby contributes to widening the inter-church dimension in humanitarian assistance to become an interfaith endeavour. The “diagnosis” of the world includes an understanding of poverty as a cause of suffering and death, far exceeding the death toll of all ongoing wars and armed conflicts. Religious communities of every faith are close to the poor and destitute and represent a major prophetic voice in the call for justice to the poor. One of the Millennium goals of the United Nations aims at reducing by 50 percent the number of people who live under the poverty line by 2015. This means that the more than one billion who live on less than one dollar a day should be reduced to 500 million over the next 10 plus years. Since this laudablegoal was set two years ago, instead of decreasing, the number of poverty-stricken people have been increasing. The situation of national budgets especially in the industrialized world, suggests that at the present pace, this millennium goal will not be reached in ten years, but possibly in one hundred. There is no doubt that there is money out there to meet these needs if nations have their priorities right. The point here is that the political statement of the Millennium Development Goals (MDGs) needs to be strengthened by a moral commitment. This is what faith and truth and demands: Justice for the poor. This is one of the outstanding challenges of religious leaders in terms of the broader understanding of the wider peace mandate of religions. Finally, although I have indicated a certain positive historical progress from dialogue via diagnosis to diapraxis, I am not suggesting that the perspectives of established religion have shifted once and for all. Rather, we are speaking of a continuous need to keep all religiously-committed men and women “true” to the promise of their faiths and to the broader vision of a shared humanity. This legacy must weigh heavily on the hearts of everyone who calls upon the Name of God as a name for peace, justice and truth. Stålsett har tidligere blant annet vært lærer i praktisk teologi ved Misjonshøyskolen, Generalsekretær i Mellomkirkelig råd for Den norske kirke, sogneprest i Elverum og prost i Sør-Østerdal prosti, generalsekretær i Det norske bibelselskap, generalsekretær i Det lutherske verdensforbund og rektor ved praktisk-teologisk seminar ved Universitetet i Oslo. Gunnar Stålsett har hatt flere offentlige verv: Han har bl a vært formann i Senterpartiet 1977-79, vararepresentant til Stortinget 1975-79, statssekretær i Kirke- og undervisningsdepartementet under Lars Korvalds trepartiregjering og medlem av Den norske Nobelkomite.